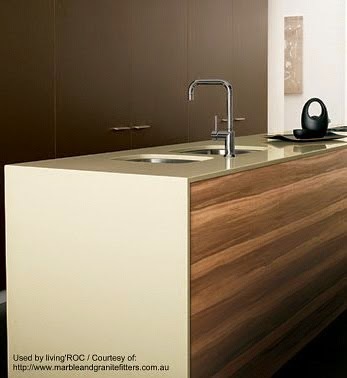 LivingRoc USA-The Blog: Natural stone or reconstituted stone? Natural stone or reconstituted stone? What are the differences between natural stone and engineered stone? This is a question here at LivinRoc that comes up regularly in your messages. Many often wonder if our products are actually made ​​of natural stone. The answer is YES! All our products are made ​​from stone blocks are 100% natural, whether travertine, granite, lava stone or marble. Let us look at the characteristics of these two materials. Renewed interest in natural stone sharpened competition and served as leverage to decrease the price significantly. > Stones slightly porous with a water repellent treatment for easy maintenance inside. Being a 100% natural material, it is necessary to treat it with respect. All materials are created equal and it is necessary to seek advice from your mason or dealer to have a long lasting purchase. - Manufacturing Reconstituted stone is a semi- natural product. It is a mix of concrete and minerals while remaining closer to the concrete structure as natural stone. Its main advantage is to imitate with talent rendering and texture of natural stone and offer further advantages of modularity in manufacturing that are not uninteresting. Fits particularly well for all uses, indoors and outdoors, and maintenance is very easy. - Maintenance : Natural stone will provide lasting effects with easy maintenance provided, you follow some basic rules, such an informed choice of stone depending on the intended use, provide protection and maintenance suitable for the type of stone selected. Using our appropriate Stone Care cleansers and waterproof sealers. For paving, cleaning with hot soapy water or a non-caustic detergent will be sufficient in most cases, whether natural or reconstituted stone. - Prestige of the material: it goes without saying that a noble and authentic materials such as natural stone will undoubtedly be an addition to your home that will withstand compared to a semi- natural or synthetic material value!